2nd Floor Convenience - 2 King Beds, 2 Twin Beds, Sofa Sleeper -- Looking for the perfect Destin Florida vacation? Enjoy 3 full size bedrooms each with its own bath. 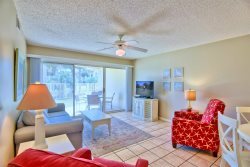 Are you looking for the perfect Destin Florida vacation condo? SPENDID & SPACIOUS has 3 full size bedrooms each with its own bathroom. Maravilla 4211 is a lovely condo just 1/2 block to the private beach and close to the north pool, tennis courts, clubhouse and fitness room at popular Maravilla. Corner unit with lots of light -- all tile floors for pet friendly convenience and cleanliness. Newly updated kitchen. Enjoy 2 balconies -- one private balcony outside the master bedroom and one off the living room. Huge bedrooms. Sleeper sofa in living room for extra guests. Call or book online today! The Woods Family had this to say about their stay, "This is our second stay at 4211 because we love it so much. Its a quick walk to the private beach and you can still hear the sound of the waves at night on the balcony. We love that everyone has their own space and there is everything a family would need to have a home away from home. We will definitely be staying there again!" Everything was wonderful here. Loved how it was clean and smelled clean. We loved our stay. Thank you. 5-star rating!